A variety of courses and projects are conducted by students and faculty at Rice Creek Field Station throughout the year. Spring 2018 offers a unique study abroad experience with Drs. Kamal Mohamed and Karen Sime. 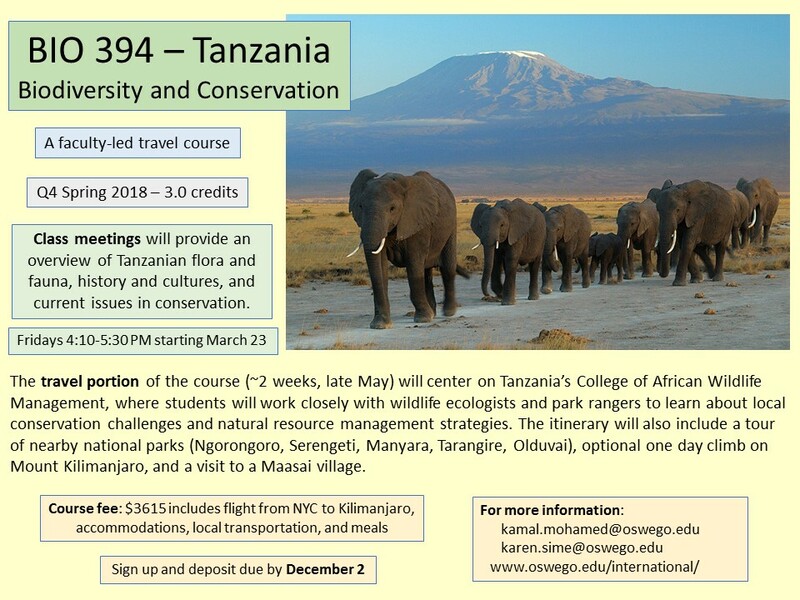 BIO 394 Tanzania Biodiversity and Conservation will begin on March 23 and culminate in two weeks of study and travel in Africa in late May. During the spring 2018 semester, the free Centro Green Shuttle runs continuously from the Marano Campus Center to lot EC-7, Laker Hall and Rice Creek Monday to Friday 7:30 am to 7:00 pm and Saturdays 10:00 am to 3:30 pm exceptMarch 10, 17 and 31 and ending for the semester on Friday May 11. The last bus from Rice Creek will be at about 6:40 and 3:10 pm weekdays and Saturdays, respectively. When the gate is closed, the bus stop will be at the upper parking lot next to the gate.